Located just 45 minutes from Orlando’s major theme parks, Wild Florida makes a fantastic day out for the Whole family with a visit to the incredible Gator Park and a choice of four breath-taking airboat adventures for you and your family to choose from. Climb on board one of Wild Florida’s U.S Coast Guard approved airboats and skim across 100,000 acres of beautiful shoreline. Experience natural Florida at its very best when you are surrounded by 100% pure Florida Wilderness. Catch a glimpse of alligators, eagles, wild boars, and many other native creatures that build their homes in the stunning waterways. The fun doesn’t stop there as you discover Wild Florida’s unique Gator Park! Children will love the chance to feed and learn about baby animals at the petting zoo and enjoy seeing the home of more than 200 native and exotic animals including zebras, turkey, watusi, zedonk, deer, wild boar, zebu monster alligators and much more! Take a wander through the beautiful 500ft Hawk Swamp boardwalk, enjoy the tropical bird aviary, Tortoise exhibit, and the amazing live alligator demonstration! 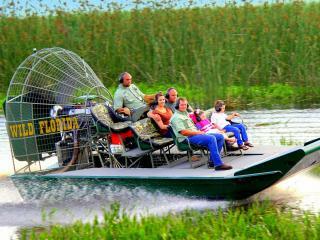 30 Minute Airboat Ride with Gator Park Admission – Join your experienced captain and travel the perimeter of the beautiful nature preserve at Wild Florida. Skim across the glassy water, and keep your camera at the ready to catch wildlife in their natural habitat. 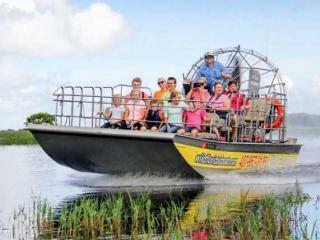 60 Minute Airboat Ride with Gator Park Admission – Discover 100,000 acres of beautiful shoreline on this extended airboat ride as you travel deep into the protected swamps, marshes and rivers that make up the Central Florida Everglades. This thrilling airboat ride gives you the perfect opportunity to spot the Floridian wildlife like alligators, birds, wild boars, and much more! 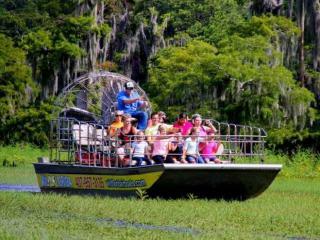 Private Airboat Ride plus Gator Park Admission – Jump on board an airboat reserved just for you and your family and get ready for an unforgettable adventure! Hold on to your hats as the Airboat picks up speed and takes you deep into the stunning 100,000 acres of protected swamps, marshes and rivers where you can discover the things you are most interested in. Get up close and personal with a Florida alligator and see many different types of Florida wildlife out in the middle of nowhere! 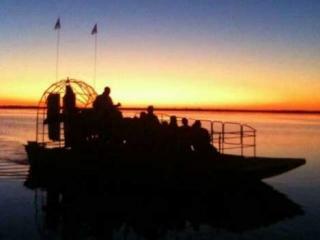 Wild Florida Airboat Night Ride – As the sun goes down discover the mysteries of the protected swamps, marshes and rivers at Wild Florida as you search for the red glow from the eyes of the incredible American alligator. Glide across the waterways with your captain for a unique experience you don’t want to miss as you see Natural Florida at its best! Location – Wild Florida is located at 3301 Lake Cypress Road, Kenansville, FL 34739 just 45 minutes from Disney. Opening hours - Wild Florida’s Gator Park is open Monday – Saturday from 9.00am – 6.00pm. 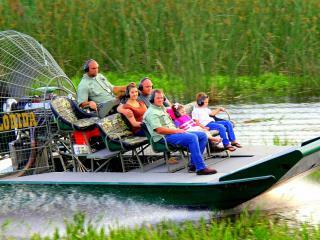 Airboat rides operate frequently throughout the day with the last ride at 4.30pm. The night ride operates at 6.00pm, 7.00pm and 8.00pm. The park is closed on Sunday’s, Christmas day and Thanksgiving.